Welcome to the Travel Blog Page on FPGP. Here you’ll find interesting and unique travel stories about places to go and things to see. Rachael Starr and Rachel Branstrom are our bloggers. Their focus on FPGP.com is writing great stories about interesting locations. Here’s the latest post on the FPGP Travel Blog..
Otoniel and Marcelino were the sprightly young men running the activities near the beach at Occidental Grand Cozumel. Tirelessly and enthusiastically they tooted whistles poolside while performing all the motions of (rather silly-looking) water aerobics for the crowd imitating from the activity pool, persuasively rounded up participants from lounge chairs for beach volleyball, and cheerfully joked with patrons on the patio. Marcelino, not quite as boisterous as Otoniel, would turn serious as the score-keeping referee of beach volleyball. Between bouts of whistle-blowing, I heard him telling a guest about the hours the staff worked. It was impressive yet sad that their work, though at a beach resort, allowed very little down time. Still, their spirits never seemed dampened, and busy days on the beach by no means halted flirtation with the young ladies. 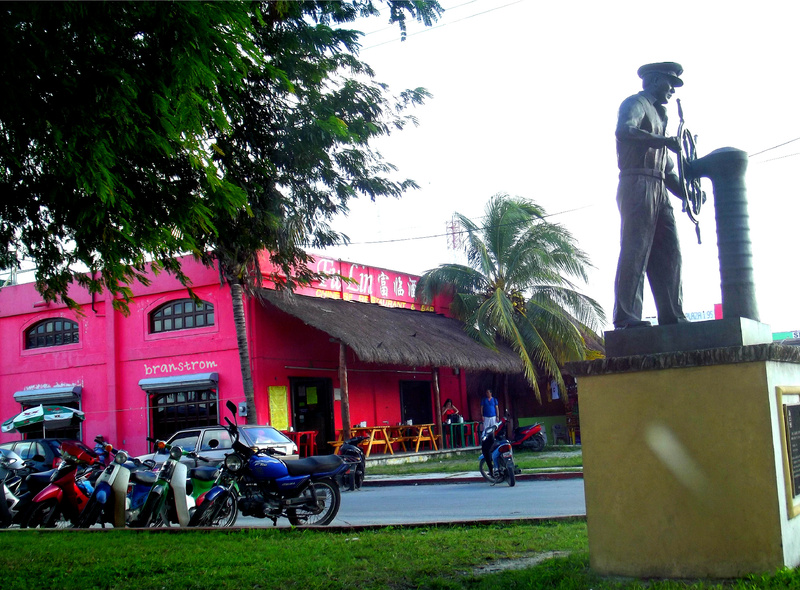 Here is a view of a Cozumel street. the disco could be the place to meet people my own age, post-family time. It implied drinks and dancing, but anyone expecting a seventies-style disco would be disappointed. Somewhat familiar with the Spanish language, and having scouted the place out with my family in the daytime, I thought I knew what to expect. However, a surprise greeted me when I walked through the doors that night. Kid’s night was supposed to take place until about 8 PM — the exact schedule eludes me now, which is just as well, since nothing ever occurred at the prearranged time. There were no clocks in the dining areas or lobby, and since we’d turned our phones off to avoid overseas charges, my only knowledge of the time was gleaned from the alarm clock in our room. I assumed this was what is referred to as “island time,” and while it was relaxing sometimes, walking into a nightclub at 10 PM to find small children was a little disconcerting. That’s not to say the environment was inappropriate for children; there wasn’t the drinking and provocative dancing you might expect at a Mexican nightclub. The strange thing was, it was only the handful of kids and their parents. Less than fifteen people occupied the place, dancing, sitting or standing around the dance floor, which was at the far corner. The bar was empty, the pool tables neglected. After standing awkwardly for a moment, taking in the scene, I left for the place I should have realized would be more my speed. A few guests dotted the lobby bar, a couple in armchairs around a coffee table, some seated on barstools. Selecting a spot at the bar, I figured I could bide my time here and check in on La Misión a while later. Here, free entertainment came in the form of teenagers trying to get drunk. I watched the interactions with amusement. A group of about five or six high-schoolers was requesting full glasses of vodka to take back to their room, while the bartender refused to give them more than a few fingers at a time, saying that more could be served after they’d finished the first. “Is this seat taken?” I turned. The question was directed to me by a blue-eyed young man around my age, a book under his arm, who I’d seen seated at the coffee table when I arrived. I’d come here alone in the hopes of making friends, so I gladly let him take the seat next to me and strike up conversation. It wasn’t until well into the night that I realized I’d encountered this individual before. “Oh! That was you?” He laughed, and there was the smile I’d seen that first evening. The Oklahoma student turned out to be the first of several I befriended that week. As the night went on, we were joined by other twenty-somethings and went as a group to La Misión. It had filled up, the children had disappeared, and loud, upbeat music rang through the place. I never did see the staff member who had asked if I’d be going. I’m not a dancer, but instead opted to play a few games of pool with my new companions. These people ended being my source of nightly fun; we continued to meet up at the lobby bar before travelling to La Misión and the beach. We dangled our legs into the shallows of the activity pool, which was quite peaceful at night. Looking back, it’s surprising that no other guests thought to go out for a midnight swim under the stars. We only saw another soul once, an employee, but he didn’t bother us. One of the guys, Cody, produced a bottle of tequila, pointing out that you couldn’t buy one at the resort. The package he had signed up for gave him a gift basket, which included the bottle. The rest of us were quite happy to help him drink it, though it didn’t touch the Herradura. Tequila Herradura wasn’t offered or displayed. Though it was available at the lobby bar, it was only through hearsay that a guest would know of its existence. It remained hidden under the bar, served only when requested. Cody had been let in on the secret by a couple he’d met a few days before I ran into him, and he shared it with me. I always tipped the bartenders, but I made sure to give them double when I ordered the Herradura. Mom and Dad’s Christmas gift to me and my sister was a “non-inclusive” activity of our choice. A serious contender was the Jeep tour — we’d seen advertisements for it, the daily rental of a Wrangler to drive around the island. From what we’d heard, though, a battle with obnoxious timeshare representatives was a prerequisite to getting that deal, and we weren’t looking for a hassle. We ended up parasailing, but we weren’t the most interesting thing in the air that day — a couple hours before us, Santa Claus sailed around, attached to a parachute soaring nearly a hundred feet above a speedboat. Actually, that number’s a guess; I can’t remember how high up the parachutes went. While it was cool seeing the land from above, parasailing didn’t incite much of an adrenaline rush — call me critical, but we were essentially just sitting there with very little motion, so it lacked the thrill of a free-fall or a roller coaster. 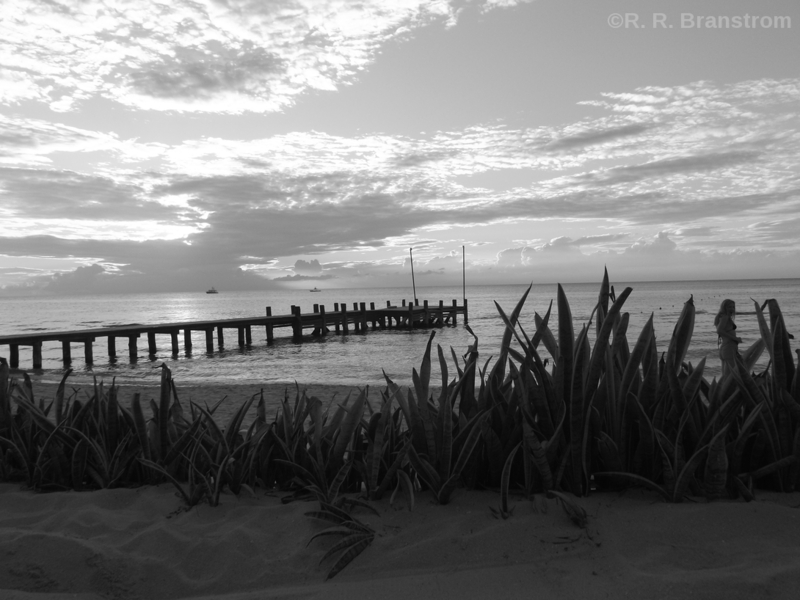 A Cozumel pier in black and white monochrome. but no one was there. By this point, we had learned about island time, so it was foolish of me to think I could put sunscreen on after the lesson. Though I’d been cautious all week, my lily-white skin crisped in the Mexican sun for about an hour and a half until the instructor showed up. Despite the tardiness, no one held any resentment when the tanned Italian showed up hauling scuba tanks and gear. He was the one my mom had called cute earlier in the week. On the better side of middle age, this man had the gray hair of sophistication combined with the abs and tan of an active surfer. His instructional speech — given first in English, then Spanish — was kind and polite yet casual and friendly, all wrapped in a beautiful accent. We might have been more distracted if we weren’t so keen to understand the message he was conveying. Two at a time, the students slipped on masks, vests, tanks, and flippers for an underwater lap of the pool, aided by Mr. Suave. My sister and I went together, and neither of us had any trouble maneuvering through the water. I found it rather neat how the amount of air in the lungs controls how far beneath the surface one hovers (I’m sure it’s different in the ocean, but in the pool it was quite simple — exhale to sink). There was an odd number of us, and after my sister and I got out, the only person left was my mother. Probably a good thing. It wasn’t working for her. She couldn’t even handle the mask. She’d start to put her face in the water, then freak out and pull off the goggles. “It’s making me feel claustrophobic,” she’d gasp, and the Italian man would gently soothe, coach, and adjust. He had impressive patience. This went on for five or ten minutes before they got out of the pool and continued a discussion in which he reassured her that he had trouble when he started diving, too. “So,” I had to ask with a grin as we walked away, “Were you having trouble breathing because of all that one-on-one time with the instructor, or were you doing that on purpose so he’d get closer?” Diving, clearly, was not for her — which was just as well, because my dad, who had tested the waters years before (pun intended), also hated it. My sister and I, however, may aim for certification in the future. Alway take time for a quick read. couple more boats than the Occidental. From this perspective, Occidental Grand seemed more relaxing in comparison. The most immediately noticeable difference was the pier: where the Occidental’s classic wooden structure stretched prettily over the water, the Allegro’s cement pier was far less picturesque. Still, it seemed like a fun place, and the straw-roofed building beyond the boats looked neat. Feeling like an invader, I hovered on the outskirts of their beach for only a minute before turning back to my sandy footprints. 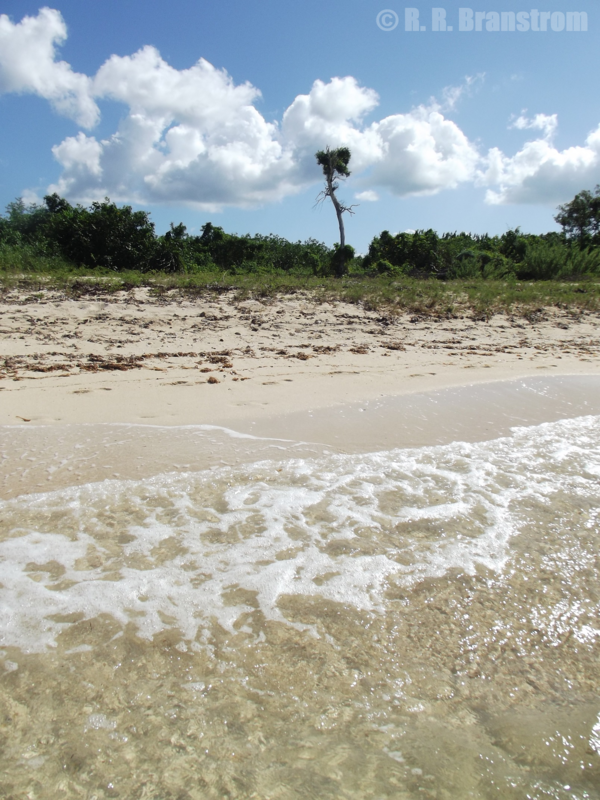 The stretch of untainted shoreline between the resorts was beautiful — only seaweed, shells, and a coupe dozen yards of white sand lay between the ocean’s edge and lush, tropical greenery. I got back in time for a swim before we had to be off. As I waded into the water, my mom was coming out. “The barracuda is out,” she said breathlessly, lifting her goggles. Though we’d heard others mention the monster fish, we hadn’t seen it all week. “Really? Where?” I took the goggles and snorkel she passed me, nodded assent to her motherly warning, and set off for the buoy line to which she gestured. By the time I reached the rope, several minutes had passed. Would the fish still be hunting? I swam up and down, craning my head every which way, squinting into the blue. It was nearby, or had been. The schools of little fish that usually flocked around the area were nowhere to be seen. It was like that beginning scene in Finding Nemo, when the clownfish emerge from their anemone to find their “neighborhood” eerily empty save for the ominous barracuda. I was tiring and ready to call it quits when I saw it. About fifteen feet in front of me hovered the creature, grayish-blue, about four or five feet long. It would have been easy to miss if I hadn’t been looking. I can’t say it swam; the fish was almost motionless as I stared at it. I edged a foot or two closer, not taking my eyes off it, grateful for the snorkel. It would have been easy to miss if I hadn’t been looking, and I shuddered to think of an unsuspecting swimmer invading its space. Slowly the predator parted its mouth, revealing long, pointed, uneven teeth. Then, very slowly, still barely moving a muscle, the barracuda turned to face me. Done. I was out. I put it in reverse, not wanting to turn my back on the thing. For a minute or two my arms and legs performed a very awkward dance as I made my escape. At maybe fifty feet away, I spun and hightailed it back to shore. I was glad for the exciting last swim, though surprised how the encounter had rattled me. We gathered our belongings and retraced our tracks, lobby to taxi to airport. This time, my camera and I sat in the front seat of the taxi. I try not to be too flagrant of a tourist, but the colorful buildings of Mexico were like nothing I’d seen. The lonely tree by the sand. 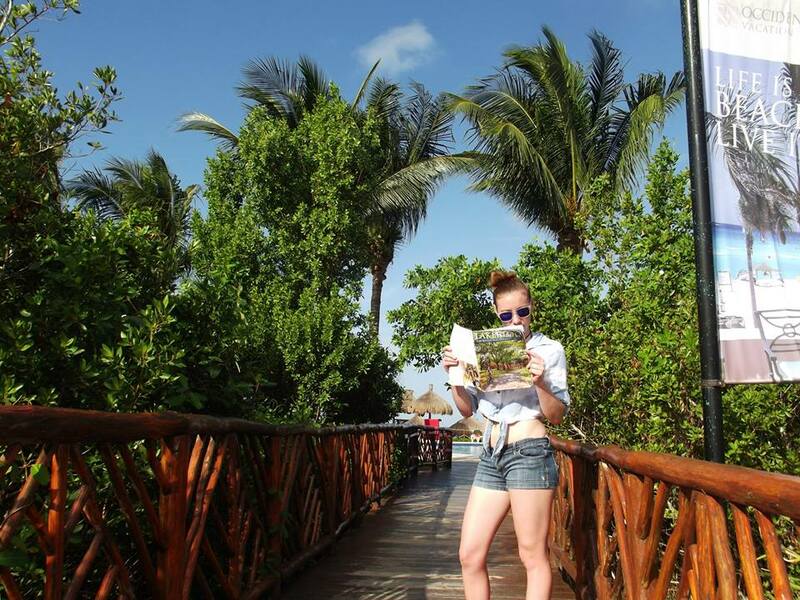 All in all, Cozumel was beautiful, and the Occidental was wonderful. Though I must reiterate that it was my first resort experience, more seasoned guests also spoke of it complimentarily. 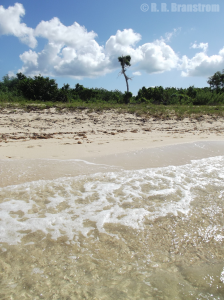 Wooded walkways, sandy beaches, and amiable staff all made for an enjoyable trip. One slightly disappointing aspect, which other reviews had warned us of, was the food, but it wasn’t terrible. Besides, if you’re going to be spending a week clad in a swimsuit on a sunny beach, do you really want incredible cuisine luring you to stuff yourself with five meals a day? That being said, I did so anyway, and washed it all down with mojitos in the sun. Can’t go wrong with all-inclusive. 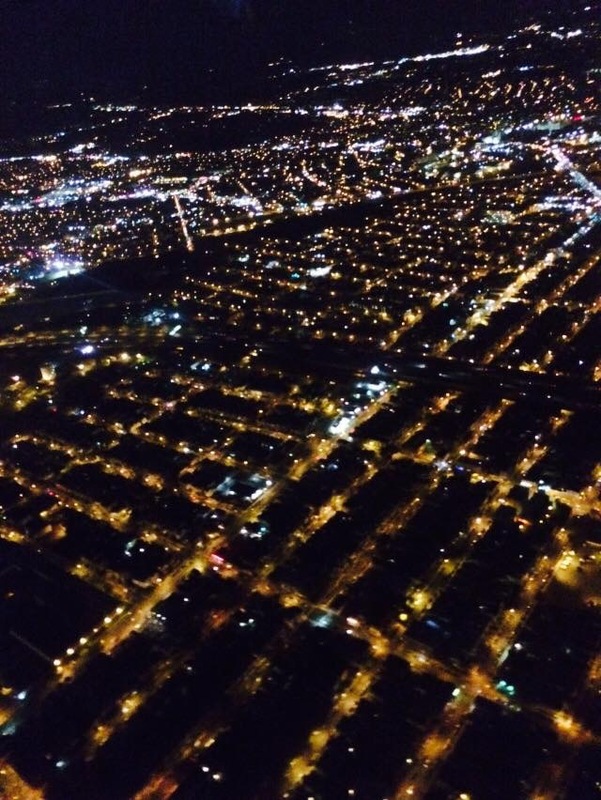 I returned to New Jersey with a slight sunburn, maybe an extra pound or two, and lifted spirits. *AFTERNOTE: I have since seen Herradura tequila in liquor stores. It’s not even expensive. Maybe it’s actually awful and we were all blinded by novelty. I’ve never been out of the continent before so I was really excited when I booked my trip to England. I took A-1 limousine to the airport and they were very professional. 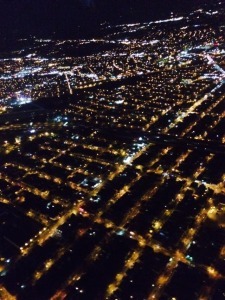 Bye-bye Newark, NJ. We’re off to London. 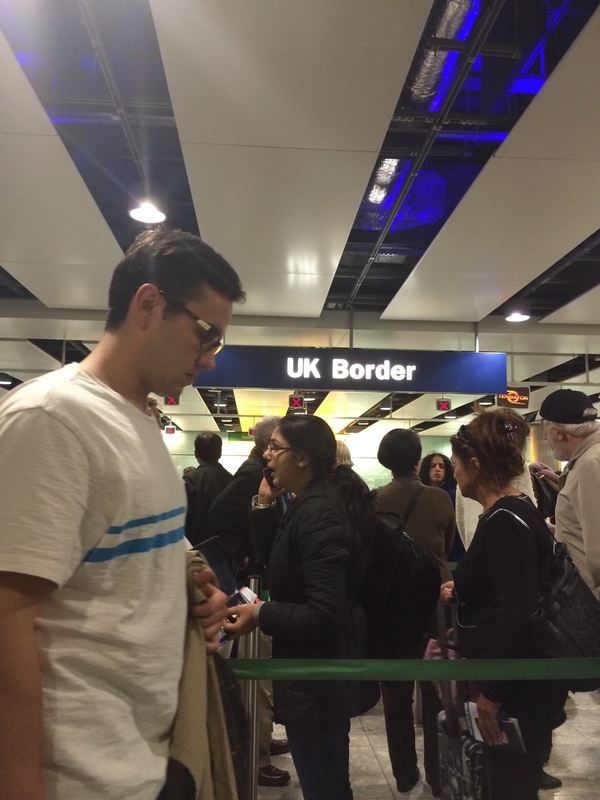 When I got to the airport I was really surprised at how quickly I got through security! I thought it was going to take much longer than it did, but I had about an hour of downtime while I was waiting for my plane to arrive. I was flying on Virgin Atlantic, and this is the first time I’ve ever used their airline. I thought I was going to be getting a double-decker plane, but it wasn’t so! Either way my flight was very nice… the in-flight experience was very luxurious. Sunrise before landing in London. I was served two meals; supper, which consisted of three choices; A beef stew, miso chicken, and a vegetarian dish which happened to be pasta. It came with a side salad and a delicious dessert, which was some sort of German orange chocolate mousse called Gü. (I wrote it down so I could remember it later) I also was allowed to choose one beverage of the alcoholic variety, on the house. 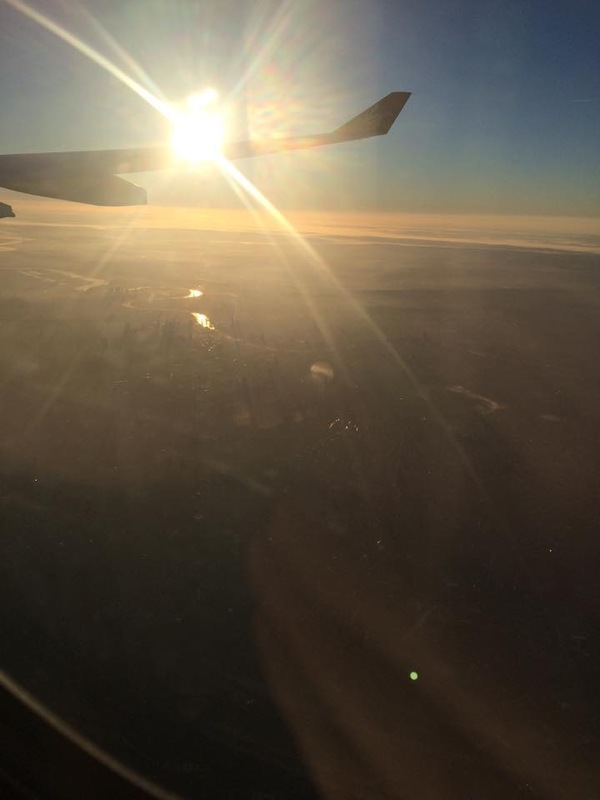 If I could recommend any sight for you to see, it would definitely be in London from the air in the early morning. It was so beautiful! The city was covered in a blanket of fog, and only the tallest buildings were peeking out above it. We were passing over London just as the sun was coming up, and the way that it hit the taller buildings cast long fingers of shadow right over the fog. Unfortunately I had a hard time taking pictures of it because the sun also caused a glare on my camera lens. Waiting in line before the questioning began. when did my mother get married, did I go to the wedding, did I have my return ticket booked, could I show it to them… Even my mother said they didn’t grill her that badly when she came over. I think my Inquisition Officer was being trained, however, which was why I was put through the ringer. He was even suspicious of my excitement of getting my passport stamped! Absolutely crazy. But once I was through? I was ecstatic! 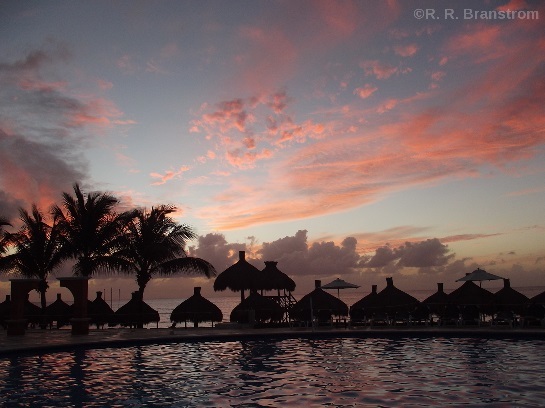 When my family began to flirt with the idea of going away this past Christmas, Occidental Grand at Cozumel was recommended to us by a friend who frequented the resort. Cozumel, an island off of the Yucatan Peninsula, is part of the Mexican state Quintana Roo. Surrounded by the Mesoamerican Reef – the second largest barrier reef system in the world – it is considered one of the top dive sites for SCUBA enthusiasts. The friend was a diver, and although we weren’t, the Occidental Grand at Cozumel had already made my dad’s list of potential destinations. He accepted the suggestion and booked a six-day stay for the four of us from December 21st to 27th. It was my first time going to a resort, let alone an all-inclusive one. I took that description to mean the guests were able to eat and drink to their hearts desire, limited only by the size of their stomachs, the expenditure of supplies, and the satiation of their desire. 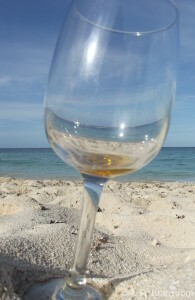 Beyond the food and drink aspect – and, I supposed, the beach — I didn’t know what to expect “all” included. I would learn that while many amenities were accessible to all guests, there were still features that required payment or an upgraded package. Upon landing at the Cozumel airport, we needed transportation to the Occidental. Arrangements existed for some travelers; taxis waited just outside the doors for those that had booked via Apple Vacations. We had made our reservations through Expedia. The last-minute booking was reasonably priced but apparently less “inclusive” than others. Although no driver greeted us with a sign saying “Branstrom,” we were able to snag an unreserved cab. Welcome to beautiful and relaxing Cozumel, Mecico. After a twenty-minute or so drive through the Mexican city, the van pulled onto a curved, stone-paved drive lined with greenery. We stepped out at the covered entrance of the Occidental and were led to the reception desk. It took a few minutes for the woman to receive us, but when she did, she was pleasant and offered small glasses of wine to my parents. (I drank my mother’s.) The woman told us that on three nights, we may eat at one of the restaurants on location, for which a reservation was required, as opposed to the buffets. As there were three specialty restaurants — a Mediterranean, an Italian, and a Mexican — we made a reservation for each one. She then asked if anyone had any food allergies; we informed her of my mother’s lactose and fructose intolerance. She didn’t seem to grasp what that meant, but asked some questions and tried to understand so she could make a note of it. This was little help, however, as most of the meals were buffets. It was left up to me to ask the Spanish-speaking cooks which foods were prepared with butter. We’d had our luggage with us while at reception, but when we were finished, it was loaded onto a cart, and staff brought it — and us — to our rooms. Of the two adjoining rooms, my parents had one; my sister and I shared the other, which had two beds. Each had a bathroom and balcony. Since it was early evening when we arrived, we decided to explore the grounds before the sun went down. After dropping our bags, we thought to check the fridge before our stroll. In each were a handful of water bottles and a few cans of soda pop and beer. My dad grabbed a beer, and I followed suit, then asked, “Are we allowed to walk around with these?” It was a silly question. We were in building ten, near a shallow decorative pool bordering a cement area labeled “punto de reunion,” which we would later learn held night entertainment. Off to one side, a red sign bore a map, which we attempted to study. We had been given pamphlets outlining the events of the week, which surely contained a map as well. However, as they also contained abysmal English, I’d become distraught and left them behind. 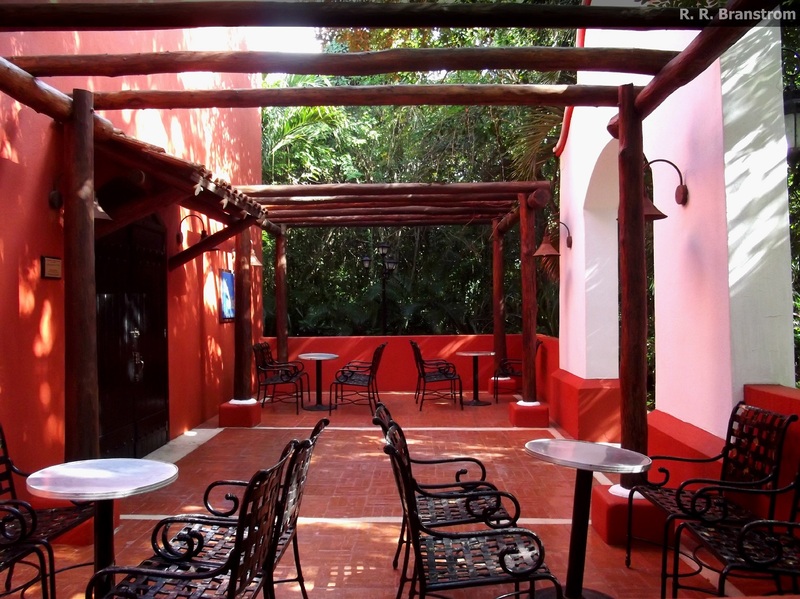 “So behind us is the front desk and ‘La Posada’ – that’s the dinner buffet place – and ahead are the pools and beach –” “Yeah, and the map shows you the general location of the buildings,” came a voice from behind us, “but not the walkways. Just gotta wander and guess.” We all laughed as a passing young man flashed us a handsome grin before continuing down one of the inscrutable paths. It wasn’t difficult. The sidewalks were fairly straightforward, and I heard one guest remark how much he enjoyed the foliage-skirted pathways in comparison to the large open spaces of other resorts. There were a few things it took us several days to figure out: the locations of the gym and spa (around the side of the nightclub and up a flight of stairs), the tennis courts (hidden by woods, also behind the nightclub), and La Piazza. The gym and spa we weren’t interested in, as there was an additional fee for their use. The confusion surrounding La Piazza was due to misleading advertising; it had been described as a pizza restaurant open from 9 PM to 1:30 AM, when in actuality it was the same space as La Posada, repurposed to serve only pizza during these hours. La Posada was the name given to the buffet hall by the lobby during breakfast and dinner. Lunch took place at the Beach Club, a covered patio with a gorgeous view of the ocean. Picture perfect sunsets on the water. Lounge chairs lined the white sand, along with sturdy umbrellas with small wooden tables attached. On the edge of the beach by the pier sat a few small boats. I think there were a couple of kayaks and a paddleboat, but my father perked up at the sight of two Hobie catamarans. That first evening, the sails were already wrapped around the masts; we wouldn’t be taking them out that night. Regardless, my dad immediately approached the amiable fellow tending the boats, Nick. The two chatted about sailing, then we departed with the promise to return for a boat ride in the sun. Not counting the Kid’s Club, a sort of day care, the Occidental had two swimming pools, both surrounded by a patio and beach chairs with umbrellas. The larger of the two was nearest the beach, the lunch buffet, and the action. It was the “activity pool,” and it was here that beach volleyball, water aerobics, and scuba lessons took place. That’s not to say people weren’t free to swim and play at their leisure, though. Events occurred a few times a day, and although there was a sign near the pool listing the times of each activity, they would often be late or even skipped entirely if no one was interested. A ping pong table and a giant chess set stood on the pavement, begging the attention of children and adults alike. A railed boardwalk through a mangrove reserve led from the pool by the beach –which was at the end farthest from the resort’s entrance — back towards the center of the Occidental. It was a short but pleasant walk, interrupted strangely by red and yellow caution tape (“¡peligro!”) wrapped around the banisters every ten yards or so. The structure wasn’t noticeably damaged, but must have been loose enough to merit these warnings that a fully grown man shouldn’t put all his weight on them — warnings too bright for even the tequila-addled to miss. I never saw anyone working on fixing the railing, but I did notice more tape appearing. I hope repairs have been made or are in the works, because the sloppiness distracted from an otherwise lovely stroll. A friendly local nature resident. The short boardwalk ended at the “quiet pool,” located near some of the last accommodation buildings. It truly was quiet; patrons with books dotted the lounge chairs throughout the day, and I don’t think I saw anyone actually in the pool more than once or twice. The only slight commotion brought to this area was when the iguanas appeared. 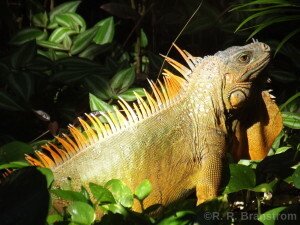 In the grounds (and trees) of Occidental Grand Cozumel reside several iguanas, beautiful creatures whom clearly avoid the busy areas. There were a few green ones and a couple gray ones, but the most magnificent was the largest, a massive-jowled orange one with spines along his back, looking stoically reminiscent of a dinosaur. His home was close to the quiet pool, and his presence incited the pulling out of cameras and excited chatter by those who noticed him. The morning of our first full day, my sister and I decided to go snorkeling. To rent the equipment, we had to go to the dive shop, a small building on the beach next to the lunch buffet. Morning activities were apparently popular; there was a short line outside the window. In the few minutes we stood in line before reaching the counter, I tried not to noticeably ogle the coming and going scuba instructors, all of whom were gorgeous and spoke in different accents. When we reached the counter, the girl working — also beautiful and charming — gave us a paper to fill out since it was our first time checking things out. Any subsequent time we wanted to check out equipment, we’d need only give our room number. The materials were due back in two hours, the girl informed us pleasantly. After being handed goggles with snorkels and flippers in our sizes, we grabbed life jackets from a rack and headed to the water. The first time was a little difficult, but I got better in the following days. The flippers hurt my feet, but they did make swimming easier and I tired far too quickly the one time I left them ashore. Hayley discovered that by lying on top of her life jacket as opposed to wearing it, she was able to drift along and gaze at the life beneath her. The water was teeming with fish, even in the swimming area. Near the buoys were large rocks and what I think was the start of the reef, and that was where the best action was. Schools of colorful fish, large and small, were numerous. Most of them didn’t mind people, either, and my dad said one fish followed him around and kept nibbling at him. Two or three times I spotted a neat little ray — like a stingray, but with two rounded fins on its tail, and barely over a foot long. I even found an octopus living under a rock right in the middle of the swimming area, though I only managed to locate it once. We heard tales of a full-grown barracuda — the “shark” a little boy excitedly reported could probably be chalked up to its emergence — but we went most of our trip without encountering the beast. On some days the water was clearer than others. We were lucky enough to have beautiful weather our entire stay, though rain had been in the forecast. The temperature hovered around 75 degrees, and the water was the warmest I’ve ever known — though my basis for comparison is comprised of the Jersey shore and Lakes Superior and Michigan. On the patio by the activity pool was a bar. Though this was the smallest — simply a covered stand — it was the busiest as it was right off of the beach. The beach club (the lunch buffet, between the activity pool and the dive shop) also had a bar, but it was only open during certain hours, and they had a dress code, minor as it was: shoes must be worn, and no swimsuits. That translated to “throw on a t-shirt and flip-flops when you want lunch.” At the pool bar, though, a patron could be in sopping wet swim trunks and be served endless mojitos. It was well stocked with liquors and mixers, though there were only ever one or two beers on tap, an ale and a lager. They had non-alcoholic selections as well; my sister enjoyed the blended virgin strawberry daiquiri. Wasn’t drinking on a beach in Mexico inherently validated? “This is only my second one,” I said on the defensive, though I knew he was just teasing. “But how old are you?” The young man asked. They asked for no ID at any of the bars. “I’m twenty-three!” I said indignantly. Nearly five years I spent in Sault Ste. Marie, Michigan. I was a curious out-of-state college student and a permanent tourist, my head turning every which way in awe. This was on a border of more than one kind: where Lake Superior joins Lake Huron. It is also the site of a link between the United States and Canada, and my years there marked a border-crossing into adulthood. Spanning north and south, the International Bridge connects Sault Sainte Marie, Michigan, and Sault Sainte Marie, Ontario; running east and west in the canal below, the Soo Locks guide massive freighters across the Great Lakes. 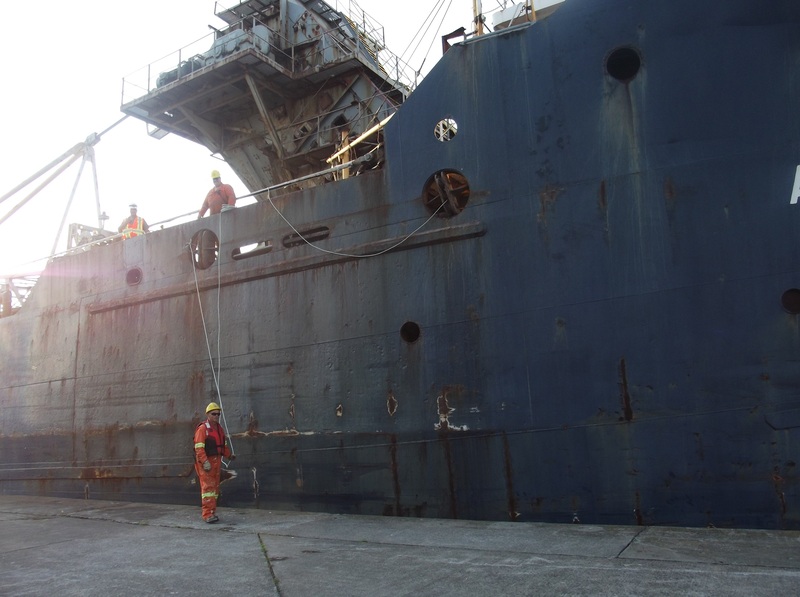 This area is rich in history and today hosts the busiest shipping locks in the world. Sault Ste. Marie is not the final destination for the 10,000 vessels that glide through its waters yearly, but for many travelers, it’s a vacation hotspot. 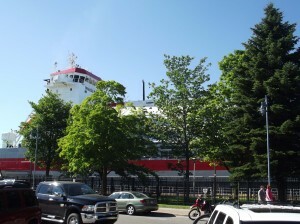 Even in my senior year as a converted Yooper (for this is what residents of Michigan’s Upper Peninsula are called), it was on more than one occasion that I found myself standing amongst the tourists in the Soo Locks Park. In addition to the gardens, fountains, and monuments one would expect to find in a park, here viewers can stand atop observation decks and watch the locking process occur. A segment of the river, outfitted with sets of enormous watertight gates, forms the locks. A single lock is comprised of two sets of gates that, when closed, raise or lower the water level in order to portage ships to the other side. When a vessel heading east from Lake Superior enters the canal, it is 22 feet above the level of Lake Huron. A gate opens, and the ship enters the lock. It halts before the second gate as the first closes behind it. Slowly, water is released from the enclosure, and the ship lowers to the water level on the other side. If a ship is heading towards Superior, it enters from the east and water is allowed into the lock until the ship is raised the necessary amount. The second gate opens, and the vessel continues its voyage. A lucky onlooker might see a cruise ship, sailboat, tall ship, or military vessel, but these pass through the locks far less often than freighters – which, given their size, are impressive in their own right. The binational pair of cities by the same name are known colloquially as the “Twin Saults” or simply “The Sault” (pronounced “soo”). In the 1600s, the river separating the two bore rapids dropping 22 feet and banks supporting a large Chippewa Indian community. French settlers called it by the Old French word for “falls” or “rapids” – “sault.” In 1668, Jesuit missionary Jacques Marquette named the river after the Virgin Mary, and the first European settlement in Michigan was christened accordingly. 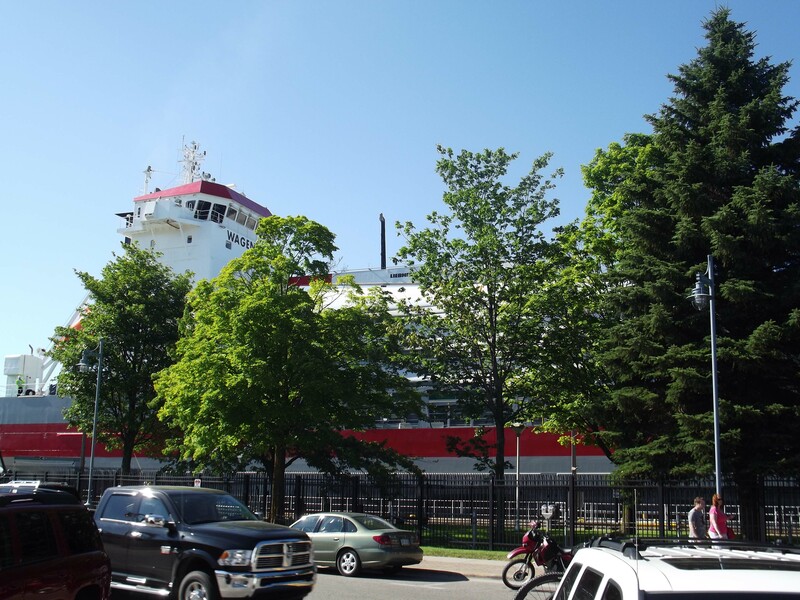 Sault Sainte Marie, therefore, loosely translates to “the rapids of Saint Mary.” While the early Native Americans and European pioneers were able to carry their canoes around the falls of the St. Mary’s River, growing industry demanded accommodations for larger boats. The only link between Lake Superior and the other Great Lakes was to grow to be a major point in maritime transport. Since the first bypass of the natural hurdle was constructed on the Canadian side by the British in 1797, the straits have undergone a succession of constructions. It may be surprising to some that the design has not been greatly changed, but the first engineers clearly comprehended that a locks system was exactly what was needed to circumvent the rapids. Currently, five locks exist in the Soo, but not all are functional. Used regularly are the Poe and MacArthur locks, operated by the U.S. Army Corps of Engineers. The other two American locks, the Davis and the Sabin, are inactive. The fifth and smallest lock, located on the Canadian side, is used for recreational boats. As navigation season at the Soo Locks halts from mid-January to late March, my advice to any prospective visitors would be to make their journey during the summer months… unless, that is, they’re avid snowmobilers. 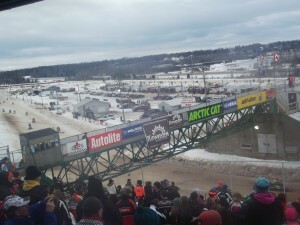 The International 500 Snowmobile Race is hosted annually in Sault Ste. 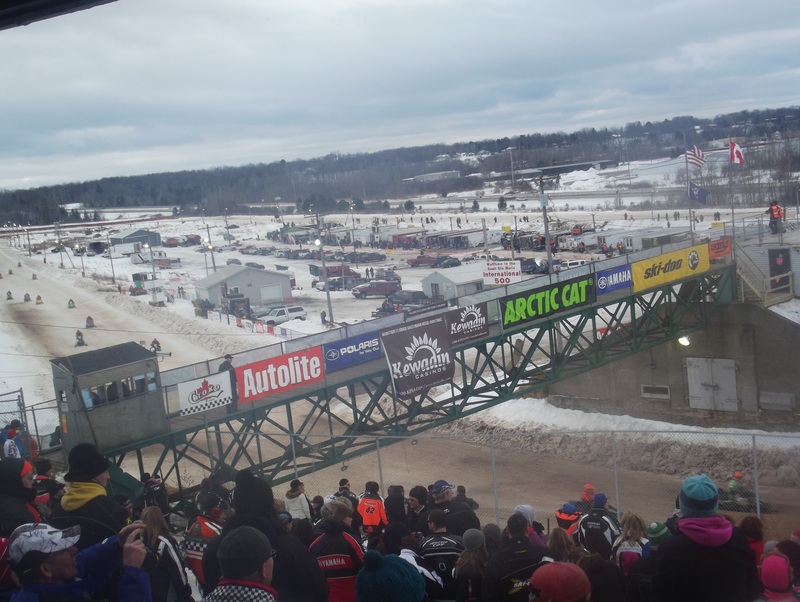 Marie, Michigan, and draws a wide crowd, usually from neighboring northern states and Canada. I’d recommend it to NASCAR fans who possess very warm clothing and an affinity for beer. Just as big a hit on race weekend is the pub crawl, for downtown Sault boasts a string of bars, which are located for the most part conveniently along one stretch of Portage Avenue. Lake Superior State University, a small school situated on the second site of U.S. Army Fort Brady, drew me to Sault Ste. Marie. Built to defend against British infiltration from Canada following the War of 1812, Fort Brady was originally constructed parallel to Portage along the river. Due to expansion of the locks, however, in 1852 it was deemed necessary to move the fort to higher ground. By 1893, its new home was about half a mile uphill. The original site, now Brady Park, has been added to the National Register of Historic Places. Though the main goal of Fort Brady was to protect the canal, it was used for training during the Spanish-American War and housed 20,000 troops during World War II. The fort was placed in Inactive Status in 1944 and was sold in 1946 to the Michigan College of Mining and Technology. Today, the fourteen remaining structures of Fort Brady form the heart of the campus that is now Lake Superior State University; the college separated from Michigan Tech in 1970 and gained university status in 1987. The Sault does not function as a typical college town. In recent decades, the main industry of Michigan’s Upper Peninsula has shifted from mining to tourism, and Sault Ste. Marie is a prime setting for the latter. For a few summers, I worked at a coffee shop on West Portage Avenue, a strip the locals call “Fudgey Lane.” One side of the street is comprised of souvenir shops, small local businesses, and fudge and ice cream parlors. This stretch is bustling in the summer, but shuts down in the off-season without visitors to stimulate the community’s economy. Just across the street is the town’s crown jewel – the water’s edge, frequently bearing a looming vessel edging through the locks. It never failed to thrill me when a thousand-foot-long freighter would rumble along and rattle the shop’s windows. I loved my position as local barista, giving directions and advice to travelers, alternatingly listening to stories and advice they imparted to me. They would give me details of their motorcycle tour; I would suggest they relax at Sherman Park, the nearby beach where freighters cruised by at a safe distance from swimmers. When they proclaimed their passion for naval history, I would ask if they’d seen Valley Camp, the ship converted into a museum and permanently docked on East Portage. For hungry visitors, there are three places I highly recommend, one of which I would recommend even if they were not hungry: The Antlers Restaurant. Its theme, as the name indicates, is the amazing display of over 200 animal mounts. The Antlers is famous for its steaks, but if a burger sounds better, my advice would be to grab just a drink at the bar and head to another destination for your meal. Clyde’s Drive-In makes the best burger I have ever had, hands-down, and I have yet to hear a disagreement from anyone who has eaten there. It’s a tiny place tucked away next to an apartment complex under the International Bridge, so many tourists aren’t even aware of its existence. Locals and college students, however, anticipate the date of its opening every spring – Clyde’s, like the downtown shops, closes in the winter. My third eatery suggestion would be for those looking for a more refined atmosphere than a drive-in or a dining room covered in animal heads. Karl’s Cuisine Café and Winery uses regional ingredients and serves wine made on location. Found on West Portage Avenue, the family-owned restaurant makes a good lunch or dinner stop and is within a short walking distance of the Locks Park. Sault Ste. Marie, Michigan, is a town that hosts beaches, historic buildings, and a gateway to Canada. It holds a university atop a hill, a view of monstrous boats, and a slew of bars that only the most champion of drinkers could tackle in one night. The winters are character-building, and the temperate summers melt away the seasonal blues. The oldest city in the state was my home for four and a half years; even so, it may well be my next vacation.